Elevated ICP due hydrocephalus: Signs of hydrocephalus such as lethargy, upgaze paresis, or full fontanelle/splayed sutures in infants may be seen at presentation. Cerebellar dysfunction: Altered gait, either profound or subtle, may be demonstrated on examination at presentation. Other signs of cerebellar dysfunction such as truncal or appendicular ataxia are less common. Cranial neuropathies: These are relatively uncommon at presentation. The most common cranial neuropathy at presentation is sixth nerve palsy. Packed red blood cells: A type and crossmatch of packed red blood cells is done in preparation for possible bleeding at surgery. 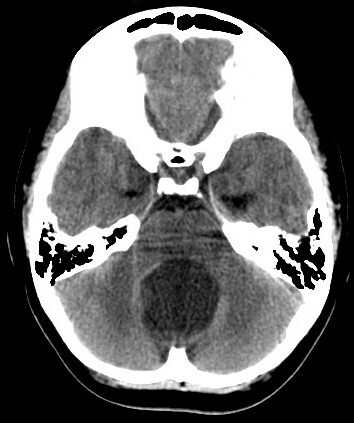 Hypo- or isodense lesion: CT scans of the brain are often performed as a screening examination in patients who present with nausea, vomiting, or altered mental status. A noncontrast CT of a cerebellar astrocytoma typically shows a lesion that is hypodense or isodense to surrounding cerebellum (4). Noncontrast CT scan of cerebellar pilocytic astrocytoma : A cystic lesion with hypodense nodule is apparent on the right side. MRI of the brain, with and without gadolinium, is the imaging procedure of choice. It should be performed as soon as possible after admission unless the patient’s condition is deteriorating from hydrocephalus, in which case the hydrocephalus must be addressed first. 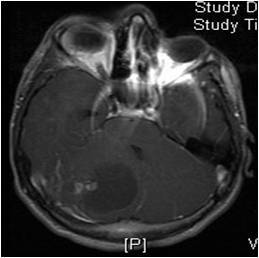 Pilocytic astrocytomas: These tumors are typically hypointense on T1-weighted MRI and hyperintense on T2-weighted MRI, and they tend to enhance with contrast (14). The “classical” pilocytic astrocytoma of the cerebellum is cystic with an enhancing mural nodule. These walls can be of variable thickness and enhance. T1-weighted MRI with gadolinium of cerebellar pilocytic astrocytoma: Note enhancing mural nodule on the lateral wall of the cyst. T1-weighted MRI with gadolinium of cerebellar pilocytic astrocytoma: The cyst’s wall is irregular with variable thickness that enhances with gadolinium. MRI of the total spine: Leptomeningeal disease is much less common in cerebellar astrocytomas than in medulloblastoma or ependymoma, but the pathological diagnosis is often not certain on the basis of preoperative imaging. Therefore, in general, patients with infratentorial tumors typically should have an MRI of the total spine preoperatively, as it may be difficult to distinguish between leptomeningeal disease and surgical debris on a postoperative spine MRI.